Rough day. I still haven’t given up on my plan to cook arepas. But most recipes call for “pre-cooked corn meal.” Don’t have any of that. So I hunted around until I found one that makes do without it. It didn’t even come close to working. Honestly don’t know what the problem was — the concoction was way too wet from the start. Tried adding in more cheese and letting it sit longer, but what went in the pan was a gloppy mess. It didn’t come out a gloppy mess, though, because it didn’t come out at all. Stuck like crazy. Geesh. And I was already in a bad mood. But still, Picky Niki was waiting. So I decided I would whip up some cabbage loaf, a recipe I found in a French cookbook. (Our neighbor gave us a cabbage the size of my husband’s head, which is weirdly bigger than an average human head.) But it takes 3 eggs to make a cabbage loaf and I only had one left. Heavy sigh. 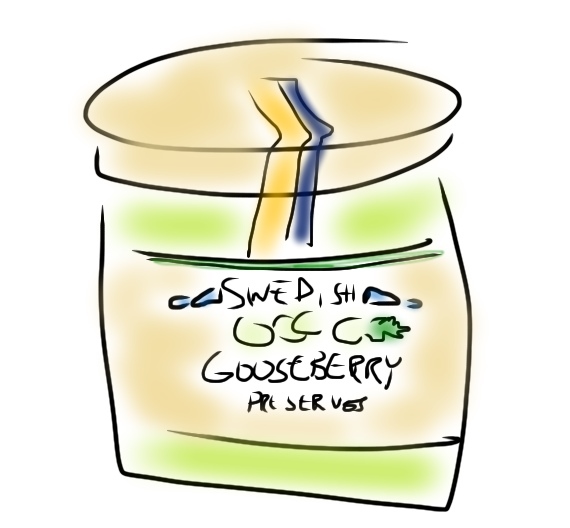 In the end I went to my emergency cupboard and grabbed a jar of gooseberry preserves I ordered online. I had wanted to sample fresh gooseberries, but I couldn’t find them in season. I’m not sure if the fresh ones would have been better, but the preserves were the turd topping to my dastardly day. Kind of tasted like gelled raisins. Gak.